Alison Stone Thompson of Wexford has been hired for Wexford’s side of the partnership. Savannah’s Trey Rossiter is the development advisor located here. What does matter is the company be established — and ambitious. “This is a clear stepping stone into the European market as a whole,” Rossiter said. “The Irish companies can consider Savannah a foothold, establishing a presence in the U.S. market,” Rossiter said. “We will soon be the only English speaking member of the European Union,” Thompson said. “You’ve got a free service right here at their disposal,” Tollison said. By 1861, according to Wexford Savannah Axis, 14 percent of Savannah’s population was Irish-born, with a majority being from Wexford. Wexford-Savannah Axis is a scholarly endeavor to understand the relationship between Wexford and Savannah. 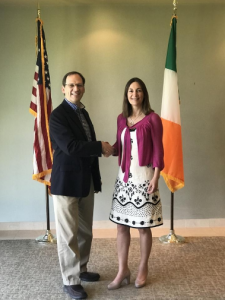 Georgia Southern University’s Honors Program and Center for Irish Research and Teaching have sponsored students to participate in summer research programs to investigate the Wexford-Savannah connections since 2014. The founding partners in the Wexford-Savannah Axis research consortium are Georgia Southern University, the Savannah-based Georgia Historical Society, Waterford Institute of Technology, a university in southeastern Ireland; and the John F. Kennedy Trust, a heritage foundation that operates the Dunbrody Emigrant Experience Center in the historic County Wexford port of New Ross. The ballast stones from Wexford and other places around the world were used to “pave” River Street.